Cyber Zen Sound Engine is a contemporary ambient project hailing from Houston, Texas byGraceNotex (Daniel Thompson) and Smith6079 (Clay). After they finished the album “Ausländer”, the duo enlisted British composer Tom Boon (known from EnoWeb) as a full member to the project. 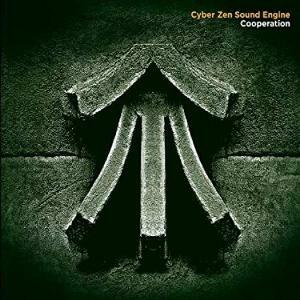 Cyber Zen Sound Engine’s “Cooperation” emerged a bit like a phoenix from the wreckage of the project “Hemispheres”. The album “Hemispheres” was intended to be a two disc set with the theme of hemispheres (dualistic systems, the hemispheres of the brain, Eastern and Western cultures, cycles of dark and light) running abstractly through out. Disc “East” of the set was the more ambient and atmospheric disc (“No East, No West” and “Foreboding” were originally on that disc), while disc “West” was the more melodic and often more aggressive collection of themes and music (“Obligation” and “Tomorrow and Tomorrow and Tomorrow” were salvaged from this disc; none of the more aggressive pieces survived, however, a remix of one of them is the soundtrack to the Cyber Zen Sound Engine’s video “Warning Camera” currently on YouTube). Both artwork and packaging were designed to continue the hemispheres theme: there was no “back” cover, instead there were two “front” covers on the outside of the digi-pac tri-fold. Cyber Zen Sound Engine debuted a version of the “Hemispheres” project as part of an installation of Clay’s (Smith6079) artwork, including some electronic art pieces he and Daniel collaborated on. At that time they were very pleased, but felt “Hemispheres” could be made stronger. A major hurricane, and the ultimately fatal illnesses of both Daniel’s parents delayed further work on the project. When the band were finally able to concentrate on the project again, Clay and Daniel found they were quite some distance apart, musically and personally. For quite sometime it looked as if nothing would be released from project. Clay felt the project was moving too far musically from Cyber Zen Sound Engine’s previous releases, while Daniel felt it was time to expand their musical range. Fortunately, there was Tom Boon, who had become the third member of Cyber Zen Sound Engine for a while. Tom played a crucial role in mediating a compromise to save at least a fraction of the project. In the end they salvaged a number of tracks from “Hemispheres”, combined them with updated versions of unreleased tracks that preceded “Hemispheres” to create “Cooperation”. The idea of cooperation as a theme and title for this cd came from Clay (as does all of the cd’s artwork). Most of the pieces do in fact in some way support a concept involving cooperation or its absence. I love talking about music, but I’m always a little uneasy discussing the specifics of inspiration, and my own interpretations of our work. I’ve always considered every listener’s own interpretation to be as valid as mine (I think art at its best is a very personal experience). One of the reasons I prefer to create instrumental music rather than vocal music, is that instrumental music imposes less of a predefined narrative on the listener, allows the listener to participate more in the creation of meaning. Music is a language that expresses things that words fail to convey. So trying to interpret it back into words only allows spoken language’s short comings to become apparent again. And worst of all, it is very easy to sound pretentious. But, having stated those reservations, here are some thoughts on a few of the tracks. “Mottomo Kodoku Na Basho” – The title roughly translates “The place of greatest aloneness”. I wrote and performed this piece shortly after my mother was mis-diagnosed as having a very aggressive form of cancer and given less than 3 months to live. My father and I were stunned by this diagnosis. That evening, standing on my parents’ front porch, I assured my father that whatever lay ahead, we would all go through it together. But the look in his eyes told me that when she was gone, he would experience an aloneness that I could neither share nor relieve him of. Ultimately, the diagnosis proved wrong, and though she did in fact have a terminal illness, we were allowed considerably more than 3 months to share with her. “A Tower Unto Heaven” – The title and the inspiration for this piece is taken from the biblical tower of Babel myth. The original version was part of an unfinished project for an avant garde dance troop in Houston. The arch of the music is intended to follow the arch of the story (the people coming together, the ascending of the tower, the confusion at the loss of a common language, and the scattering of the people leaving the tower unfinished). “No East, No West” – This extended soundscape was intended to paint an aural picture of a tranquil and pleasant lake shoreline. The title comes from the Zen concept that separation is merely an illusion caused my language’s tendency to divide and contrast; to define things by their opposites. “Obligation” – My mental picture while composing this piece was of a commuter on a train (hence the rhythmic element that is reminiscent of steel wheels clattering on rails being reflected back by passing buildings). Tired, perhaps a little drowsy, the commuter contemplates the doubts and stresses of often conflicting obligations in life. Commitments to family, to career, to community, to self. He slowly comes to an acceptance and a resignation about how all of these forces choose the path of his life, much as the rails choose the path of the train that rocks him along on his journey home. Since the 80’s most cds, particularly in our genre, have tended to maintain a single unified feel and perspective throughout the cd. In the last few years, I found myself preferring albums that progress through several moods and perspectives. If I want to create one unified musical mood, it is easy enough to create play lists that collect pieces with similar feel from various albums. So one of the things I set out to do on this cd was to have a great deal of variance in mood and feel, while still creating a unified album of music. There are tracks like “No East, No West” and “River Reflecting the Stars” that tend to be contemplative in a bright, overtly positive way, along side tracks like “Mottomo Kodoku Na Basho” which is sadder in its contemplation, or “Darkness” and “Swoon” which are, well… darker, and even a little disorienting. I personally wanted this album to contain contrasts of light with dark, optimism and serenity juxtaposed with fatalism and tension, periods of drifting opposed by periods of defined purposeful direction. To be human is to contain so many conflicting feelings, experiences, desires and beliefs simultaneously. I wanted this album to reflect the composing of a single identity from such seemingly conflicting elements. Talking about the music can make it seem a little ponderous and overly serious. My hope is that much of it is simply pleasant, refreshing and enjoyable, with or without recognition of deeper artistic intent.